Soldiers assigned to 1st Stryker Brigade executed the proposed Army Combat Readiness Test (ACRT) on Ready First Field, April 17, 2018. Soldiers are assisting the Army with this pre-decisional testing that is pending senior Army leadership staffing and approval. The proposed ACRT is part of the Army’s effort to optimize Holistic Health and Fitness and improve Soldier readiness. 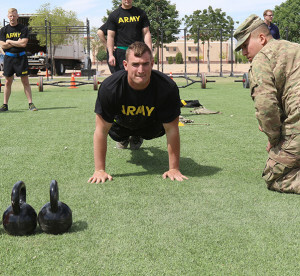 The U.S. military’s mission is to fight and win the nation’s wars, and service members must be physically, mentally and emotionally ready to fight when needed, Army Command Sgt. Maj. John W. Troxell said in an interview May 10, 2018. And in this tumultuous era, that could be at any time, the senior enlisted advisor to the chairman of the Joint Chiefs of Staff added. Troxell attended the inaugural DOD Readiness and Resilience Workshop held April 17 at Fort McNair in Washington. The workshop featured speakers and covered topics to optimize human performance through the body, mind, and spirit. Deputy Defense Secretary Patrick M. Shanahan also participated in the workshop. Shanahan opened the workshop by joining service members in a workout. 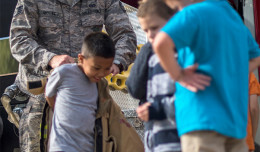 “He’s in good shape,” the sergeant major said of the deputy defense secretary. Troxell said he’s concerned about recent statistics regarding the ability of military members to deploy. Defense Secretary James N. Mattis recently came out with a deployment and readiness policy. Essentially, the policy stipulates that if a service member is nondeployable for more than a year, then he or she is processed for separation. This does not affect service members wounded in combat. 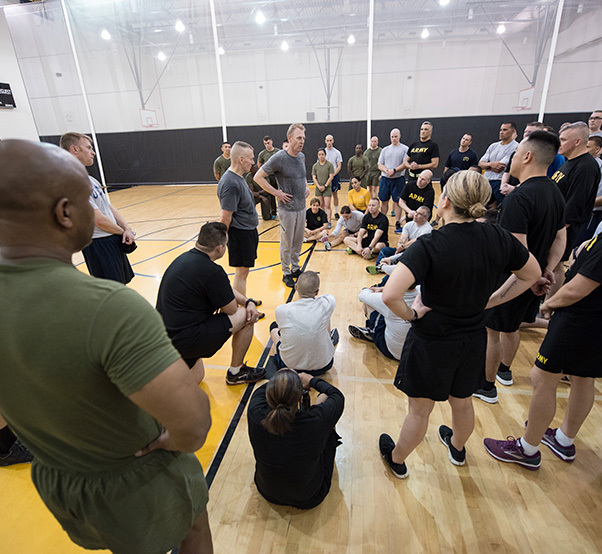 The sergeant major said he brought together civilian and military fitness and dietary experts to discuss fitness, performance, nutrition and recovery at the Fort McNair workshop. Noncommissioned officers and petty officers need to promote and encourage “a warrior/athlete culture and mentality” across the military services, Troxell said. Army Command Sgt. Maj. John W. Troxell, senior enlisted advisor to the chairman of the Joint Chiefs of Staff, hosts a physical training session with Deputy Defense Secretary Patrick M. Shanahan and service members from across the joint force at the inaugural DOD Readiness and Resilience Workshop at Fort McNair in Washington, April 17, 2018. The workshop featured speakers and covered topics to optimize human performance through the body, mind, and spirit. And, some physical fitness training seems designed to prepare people to just pass the test, Troxell said. “What physical training needs to be is a process to get someone prepared physically, mentally and emotionally for the conditions they may face on the worst day of their life,” he said. That worst day comes in a variety of guises, Troxell said. For a Soldier or Marine, it may be armed individual combat. For a sailor it could be dealing with disaster and firefighting. For an airman it could be in a convoy or on an airfield where disaster strikes or an enemy attacks. In extreme cases, there are service members who have been nondeployable for three or four years, the sergeant major said. Someone else still has to go. The sergeant major described one specialty with just 32 people. Only eight are deployable and they shoulder that burden. Medical experts who deal with post-traumatic stress say that developing physical fitness is a factor in combating that condition. Troxell said he believes that the NCO and petty officer ranks need to make change happen. Regardless of how good the U.S. military is, bad things can happen and “we have to prepare, and it starts every day with this culture of ‘I am a warrior/athlete,'” Troxell said. He practices what he preaches. Troxell has embraced a tough physical training program. The 54-year-old senior NCO still qualifies in the Ranger School five-mile standard in under 40 minutes.